Almost all solid materials, from rubber and glass to granite and steel, inevitably expand when heated. Only in very rare instances do certain materials buck this thermodynamic trend and shrink with heat. For instance, cold water will contract when heated between 0 and 4 degrees Celsius, before expanding. Engineers from MIT, the University of Southern California, and elsewhere are now adding to this curious class of heat-shrinking materials. The team, led by Nicholas X. Fang, an associate professor of mechanical engineering at MIT, has manufactured tiny, star-shaped structures out of interconnected beams, or trusses. The structures, each about the size of a sugar cube, quickly shrink when heated to about 540 degrees Fahrenheit (282 C). Each structure's trusses are made from typical materials that expand with heat. Fang and his colleagues realized that these trusses, when arranged in certain architectures, can pull the structure inward, causing it to shrink like a Hoberman sphere — a collapsible toy ball made from interconnecting lattices and joints. The researchers consider the structures to be "metamaterials" — composite materials whose configurations exhibit strange, often counterintuitive properties that are not normally found in nature. In some cases, these structures' resistance to expanding when heated — rather than their shrinking response per se — may be especially useful. Such materials could find applications in computer chips, for example, which can warp and deform when heated for long periods of time. "Printed circuit boards can heat up when there's a CPU running, and this sudden heating could affect their performance," Fang says. "So you really have to take great care in accounting for this thermal stress or shock." The researchers have published their results in the journal Physical Review Letters. Fang's co-authors include former MIT postdoc Qi Ge, along with lead author Qiming Wang of the University of Southern California, Jonathan Hopkins of the University of California at Los Angeles, and Julie Jackson and Christopher Spadaccini of Lawrence Livermore National Laboratory (LLNL). In the mid-1990s, scientists proposed theoretical structures whose arrangement should exhibit a property called "negative thermal expansion," or NTE. The key to the arrangement was to build three-dimensional, lattice-like structures from two types of materials, each with a different NTE coefficient, or rate of expansion upon heating. When the whole structure is heated, one material should expand faster and pull the other material inward, shrinking the entire structure as a result. "These theoretical papers were talking about how these types of structures could really break the conventional limit of thermal expansion," Fang says. "But at the time, they were limited by how things were made. That's where we saw this as a very good opportunity for microfabrication to demonstrate this concept." Fang's lab has pioneered a 3-D printing technique called microstereolithography, in which the researchers use light from a projector to print very small structures in liquid resin, layer by layer. "We can now use the microstereolithography system to create a thermomechanical metamaterial that may enable applications not possible before," said Spadaccini, who is the director of LLNL's Center for Engineered Materials and Manufacturing. "It has thermomechanical properties not achievable in conventional bulk materials." "We can take the same idea as an inkjet printer, and print and solidify different ingredients, all on the same template," Fang says. 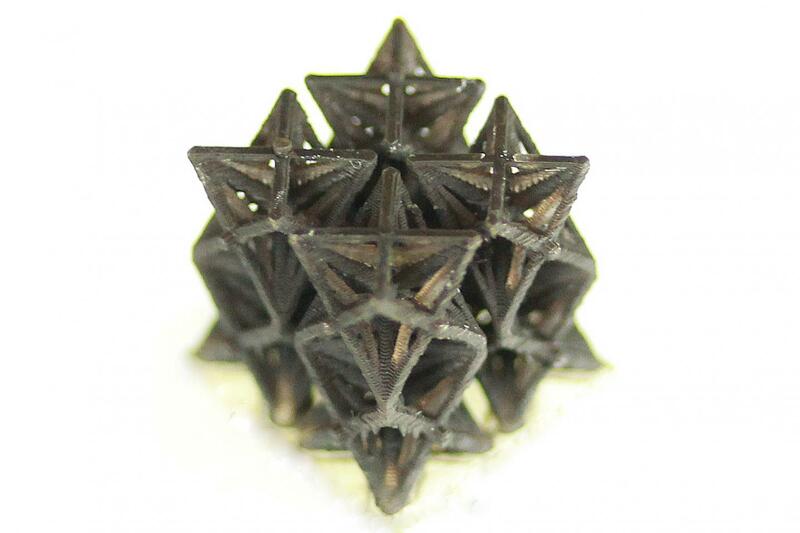 Taking inspiration from the general framework proposed previously by theorists, Fang and his colleagues printed small, three-dimensional, star-shaped structures made from interconnecting beams. They fabricated each beam from one of two ingredients: a stiff, slow-to-expand copper-containing material, and a more elastic, fast-expanding polymer substance. The internal beams were made from the elastic material, while the outer trusses were composed of stiff copper. "If we have proper placement of these beams and lattices, then even if every individual component expands, because of the way they pull each other, the overall lattice could actually shrink," Fang says. "The problem we're treating is a thermal mismatch problem," Wang says. "These materials have different thermal expansion coefficients, so once we increase the temperature, they interact with each other and pull inward, so the overall structure's volume decreases." The researchers put their composite structures to the test by placing them within a small glass chamber and slowly increasing the chamber's temperature, from room temperature to about 540 degrees Fahrenheit. They observed that as the structure was heated, it first maintained its initial shape, then gradually bent inward, shrinking in size. "It shrinks by about one part in a thousand, or about 0.6 percent," Fang says. While that may not seem significant, Fang adds that "the very fact that it shrinks is impressive." For most applications, Fang says designers may simply prefer structures that do not expand when heated. In addition to their experiments, the researchers developed a computational model to characterize the relationships between the interconnecting beams, the spaces between the beams, and the direction and degree to which they expand with heat. The researchers can control how much a structure will shrink by tuning two main "knobs" in the model: the dimensions of the individual beams, and their relative stiffness, which is directly related to a material's rate of heat expansion. "We now have a tuning method for digitally placing individual components of different stiffness and thermal expansion within a structure, and we can force a particular beam or section to deflect or extend in a desired fashion," Fang says. "There is room to experiment with other materials, such as carbon nanotubes, which are stronger and lighter. Now we can have more fun in the lab exploring these different structures." This research was supported, in part, by the Defense Advanced Research Projects Agency.